Massaman Curry Paste (Nam Phrik Kaeng Massaman). Massaman Curry is my favourite curry of all time, it is the perfect mix of flavours, rich and creamy and spicy. I usually make a batch of red, green and massaman pastes at the same time. Makes 1 cup paste (about 6 serves). In a hot pan, dry roast the coriander seeds, cumins seeds, peppercorns, cinnamon stick and dried chillis for a few minutes until the cumin seeds are lightly browned. In a food processor, process the spices into a powder. Add all the remaining ingredients to the food processer and process until the mixture is a reasonably smooth paste. The mixture can be frozen into single use portions for months or stored in a jar in the fridge for up to two weeks. 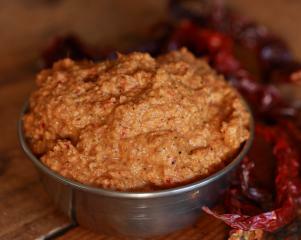 To make two serves of curry add two tablespoons of paste to hot saucepan. Fry in a little oil until fragrant and then add a tablespoon of peanut butter and two cups of hot water. Bring to the boil and then add vegetables and tofu. Simmer until everything is cooked, then add a cup of coconut milk and season with soy sauce. Some ingredients in the curry paste can be hard to find so you can make substitutions where necessary. Shallots can be replaced with regular onion. If you can’t find lemon grass replace it in the recipe with a teaspoon minced ginger, a 1/4 teaspoon of lemon zest and 1 teaspoon of lemon juice. It won’t have the exactly the same flavour but it will have a similar effect in the curry. Fresh galangal root can be replaced with a teaspoon of galangal powder or a teaspoon of minced ginger.